A general view shows several destroyed buildings in Douma, in the rebel enclave of eastern Ghouta on the outskirts of Damascus, March 5, 2018. Heavy fighting continued unabated Tuesday in the Syrian rebel enclave of eastern Ghouta, one day before the U.N. Security Council meets to discuss the escalating violence. Continuing violence has undercut a U.N.-demanded nationwide cease-fire in Syria, as well as Russia's self-declared daily "humanitarian pause" meant to allow civilians to leave eastern Ghouta. The cease-fire's failure prompted Britain and France to request a closed-door meeting of the Security Council on Wednesday. Also Tuesday, a Russian plane crashed in Syria as it was attempting to land, killing 39 Russian servicemen. Russia's defense ministry said the crash was caused by technical error and the plane was not shot down. Russia's defense ministry said earlier Tuesday that Syrian rebels, in addition to civilians, are free to use evacuation corridors to leave the besieged eastern Ghouta area. A ministry statement said the fighters could take their guns and their families, but did not specify where they would go. On Monday, an international convoy of humanitarian aid trucks cut short its mission to deliver supplies in eastern Ghouta after government forces continued their aerial bombardment and ground assault. The United Nations says another attempt is planned for Thursday. Russian soldiers are seen securing Syrian Arab Red Crescent trucks carrying aid at a checkpoint near Wafideen camp in Damascus, March 5, 2018. Monday's convoy of 46 trucks left the region's main town of Douma on Monday evening to return to Damascus without being able to fully unload its supplies due to the violence. "We delivered as much as we could amidst shelling," UNHCR's Syria representative Sajjad Malik tweeted. "Civilians are caught in a tragic situation." U.N. officials said all the aid workers are safe. 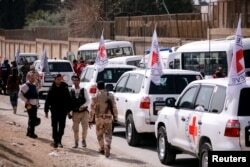 In addition to the shortened mission, the United Nations and International Red Cross said the Syrian government blocked rescue workers from loading most of the medical supplies they had planned to transport and would not allow them to be replaced by other items. International Committee of the Red Cross (ICRC) convoy seen crossing into eastern Ghouta near Wafideen camp in Damascus, March 5, 2018. It was the first aid shipment to reach the area outside Damascus since mid-February, when a deadly Russian-backed assault began on the rebels, branded as "terrorists" by Syrian President Bashar al-Assad. The Britain-based Syrian Observatory for Human Rights said at least 68 people were killed Tuesday. That pushed the death toll to 760 in the last three weeks. Syrian troops have reclaimed a third of eastern Ghouta, according to the Observatory, and are advancing further in an apparent attempt to split the rebel stronghold in two. The United Nations says 400,000 people are trapped in besieged eastern Ghouta, which it says was already running out of food and medical supplies before airstrikes began two weeks ago.